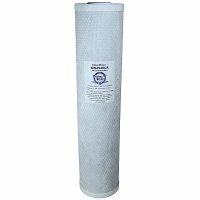 4.5 inch x 20 inch solid activated carbon block water filter cartridge with lead removal capabilities. 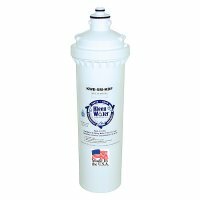 This cartridge will provide Chlorine Taste & Odor Reduction Capacity for more than 18000 gallons* at 6 gallon per minute flow rate. This cartridge is an ideal cartridge for chlorine / chemical and lead reduction which can be used for whole house applications. To prolong cartridge life and avoid pressure drop / flow rate reductions a dirt sediment cartridge is recommended as pre-filtration. It also has a dirt / sediment rating of 5 microns nominal. The extruded carbon block design will ensure that this cartridge will perform optimally for 6-10 months before being exhausted. The NSF certified coconut shell carbon provides impressive adsorbtive capacity ideally suited for water purification. The universal dimension make it compatible with filter housing manufacturers such as: G.E., Culligan, Cuno, Ametek / Pentek and others. Our PWF4520LR is a great, more affordable alternative to KX Industries 06-425-200-20 and Watts MAXPB-FF20. *Projected chlorine reduction capacity when tested in accordance w/ NFS / ANSI Standard 42 protocol.